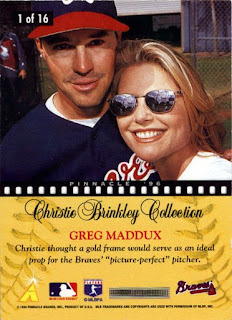 Somewhere around 1990, I remember seeing ads in the back of Baseball Card Magazine selling sets of non sport subjects. One subject that I always saw advertised in the back were card sets of Bettie Page. I had absolutely no idea who Bettie Page was and didn't really care at that point. I was scoping out oddball baseball sets and dreaming that I had unlimited money, in which to purchase those sets. As I got older, I found out who Bettie Page was. I thought it was interesting that this woman became an icon. As I learned about the history of Bettie Page, I started to admire her a bit more. I can't say that I was ever a huge fan, but I admired what people thought that she stood for. When I discovered the news that Bettie passed away this month, two things entered my mind. The recent movie with Gretchen Mol as Bettie and that set of cards that I saw advertised when I was much younger. I couldn't find the set that I saw in the back of Baseball Cards Magazine, but I stumbled upon something better. 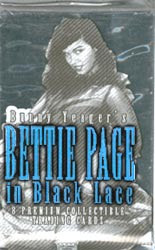 In 1995, two sets of 50 cards were produced called Bettie Page In Black Lace. Inside some packs were special "chase" cards. There were a set of five cards called Spectratone. You can find complete insert sets on eBay for under ten dollars. There is nothing particularly wrong with the images. I've seen worse on prime time television, but some may find these images objectionable. If so, then skip to the next post. I've seen many of these images in the regular eBay section, so I would take that as being fine for the general public. I can still remember the original advertisement that got me very curious as to who was Bettie Page. It stated that her whereabouts were unknown and there was a huge fanbase trying to track her down. I wondered why so many people would make such a fuss over someone I had never heard of before. Bettie was THE pin-up girl. Her poses have breached into the lexicon of America and is associated with Americana all over the world. Chances are, you've seen a photo of Bettie and had no idea who she was. These cards just seem to be tinted versions of photographs of Bettie Page. Still, they are an interesting part of the trading card culture. It just goes to show that Bettie still had legions of fans in 1995. Truthfully, I think that she's more popular than ever. Rest in peace, Bettie. Your legacy continues on. At some point during the period in which I stopped caring about baseball cards, Topps stopped caring about the checklist. The best that I can figure -- keep in mind I barely dipped a toe into the hobby from 1994 to 2004 -- Topps stripped the checklist of any remaining dignity in 2000. That's the first time I noticed the no-numbered checklists. For years, each checklist carried a number on the back of its card, just like every other card in the set. If you were collecting the set, you had to collect the checklist -- because it was a numbered part of the set -- no matter how boring the checklist was. And the checklist was issued in the same quantity as other cards in the set. You wouldn't find a checklist in every third pack, like you do today. Perhaps that was the reason Topps finally stopped numbering checklists. Some collectors were probably relieved that they didn't have to chase a checklist to complete a set. But the move hasn't set well with me. I kind of liked the checklists. 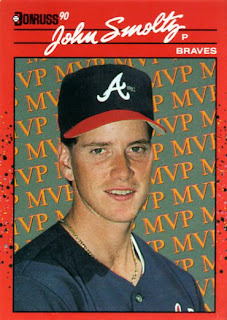 I looked forward to seeing what kind of new design Topps would come up with as a backdrop for all those players' names. And since it was numbered, you were forced to appreciate the card at least a little. It wasn't a throw-away item like it is today. What I'd like to see happen is what they previously did with checklist cards. They used to feature popular players of the day on the front. As recently as the 1990s -- 1993 to be exact -- Upper Deck featured checklists in which the list of names were printed over the top of a muted photo of players like Barry Bonds or Ken Griffey Jr. And there are several other '90s examples. This is from the 1969 Topps set, and it's probably the only card of Mickey Mantle that I own that actually has some value (all those cards that Topps has published of Mantle in the last 10 years are the very definition of the word "overproduced"). 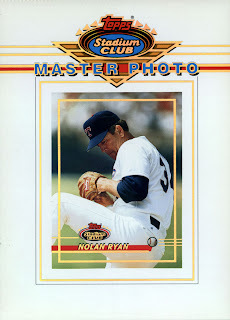 Putting a star at the top of the checklist made the card much more collectible, not to mention the fact that it is No. 412 in the set, and you couldn't have a complete set without No. 412. It'd be nice if Topps returned to this format, and featured Ryan Howard, David Wright and Evan Longoria atop its numbered checklists. Then, finally, the checklist would reclaim some of its dignity. Because as it stands now, we're using the checklist for all kinds of tasks for which it wasn't intended. I received a box of cards a week or so ago complete with nearly 70 Topps 2000 checklists, but not because I wanted all those checklists. They were used as packing material. Useful, yes. But now what do I do with them? This is one of the cards I recently received from Spiff over at the Texas Rangers Cards blog. It was one of a hefty box of Phillies and Astros he sent. I'll be refilling the box with Rangers cards for him. I have other examples of cards like this but this one was at hand. 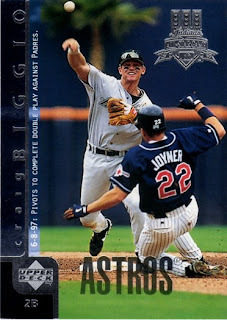 I love these cards where the back photo is a continuation of the play from the front of the card. Biggio was a great at second base. You can see the concentration as he throws the ball to first to complete the second half of a double play as Wally Joyner bears down on him. I imagine for this type of card, the photographer has his camera on autowind and just holds the shutter button down until the play is over. I know I have a two cards where the one card features the fielder and the other card features the runner with different shots of the same play. I think it's in the 1993 Upper Deck set. If I ever find them I'll post them. 26 cards. They had the same basic design as the regular cards. Bright red with confetti scattered up and down the borders. The photos are all posed and the background is MVP repeated over and over. 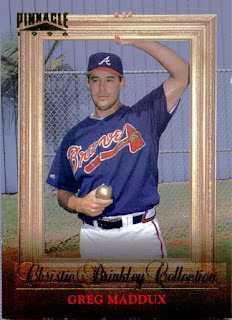 There is nothing really special about these except for the existence of an error card involving John Smoltz. 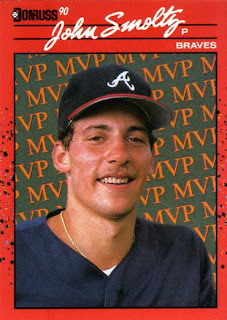 As you can see there are two versions of this card, one with a picture of Smoltz, the other with a picture of his teammate, Tom Glavine. You have to wonder how such a thing happens. My guess is that in 1990, neither of these guys was real well known. Both were coming off their first full year of pitching. It's hard to imagine someone in the baseball card manufacturing business not being to recognize both of these guys on sight, but they weren't always as famous as they are today. recently acquired the Glavine version in a pack of Donruss from a Fairfield repack box. Who says there isn't still some fun to be had from an 18 year-old-pack of cards? When I logged the card into my database I didn't really look at it closely and didn't notice the error. It was when I was going to put it in my Smoltz binder that I thought, hey, wait a minute, that's not John Smoltz! 4. Once I knew I could find a card like this my baseball card collecting was rejuvenated. 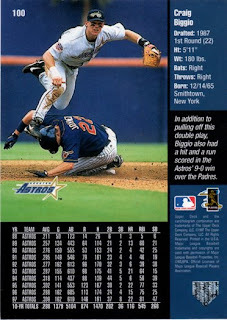 This 16-card insert set was available in 1996 Pinnacle Series 2 packs. It was inserted at the rate of 1 in 23 packs so it's not incredibly rare. I assume that the frame Greg is holding onto must be sitting on something. Or he's very strong. That thing must weigh 50 pounds. These are available on eBay. Someone is offering 25 copies of the Mark McGwire for $4 plus $6 for shipping. The McGwire books at $3 so its a pretty good deal. Someone else is offering two packs of these with Bonds, Strawberry, Clark, Canseco, Boggs and Tartabull for $99.99. I'm temped to ask him a question. "Are you kidding?" I think almost everyone as a kid had a friend who was what parents would call "a bad influence." I had one. He served as the devil on my shoulder, telling me I should do things that I kind of thought weren't right, but went ahead and did anyway. Now, I was in sixth grade at the time, so we weren't breaking the law or anything. All we did was collect baseball cards, 1977 Topps baseball cards to be exact. And my "bad influence" thought it would be a great idea to collect all of the four-picture rookie cards that Topps issued back in the mid-to-late '70s and cut the cards up, so that we had four little mini-cards. What could be better? You take one card and end up with four cards! That's quadrupling your output! I was hesitant at first, but after I saw the results, I thought they looked cool. And I couldn't wait to collect the rest of the rookie cards in the set and cut them to bits, too. After the carnage was over, I had a tidy little stack of 64 super-mini cards, no more than a couple inches wide. I tied them together with a rubber band and took them everywhere I went. I mean it, we cut up every single card. Dale Murphy rookie card? Cut up. Andre Dawson rookie card? Cut up. Jack Clark rookie card? Cut up. Tony Armas? Lee Mazzilli? Steve Kemp? Len Barker? Cut. Cut. Cut. Cut. Through the magic that is the computer and simple cropping, you can see what these hand-crafted mini-cards looked like. I kind of like the black line separating the photo from the type. A nice touch, don't you think? Of course, I don't really mean that. For years, I couldn't believe that I could be that dumb, and I blamed my friend for leading me to the dark side once again. I recovered only a few of those 1977 cards intact. I do have the Dawson rookie card again, although it's fairly beat up. I have the Dale Murphy card and the Scott McGregor rookie card. And if anyone cares, I also have the Len Barker-Randy Lerch-Greg Minton rookie card. But there are so many of the cards that are gone for good, because I tossed out those mini-cards the year after making them, basically because I didn't care about them anymore. One day I will try collecting the 1977 Topps set, and when I get, say, to card No. 490, which features Bill Almon and Mickey Klutts, it will be the first time I will have looked at that card in my hands since my fingers were wrapped around a pair of scissors, and I was cutting that cardboard to bits. 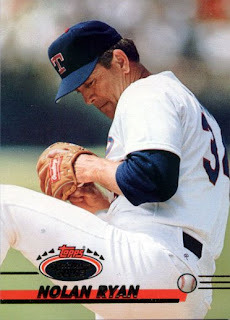 While catching up on my blog reading, I wandered across a post about the 1991 Topps Roger Clemens card on Cardboard Icons. In the comments, he wondered why they didn't use that photo in Stadium Club. I decided to mess around in MS Paint a little at lunch and see how that shot might have looked on a Stadium Club card. There is something missing... It took me a while to realize what it was that I liked so much about the original. I loved the team wordmarks on the 1991 Topps. I had not been very fond of any Topps designs since the 1987 set. Then I realized, the use of an official logo hadn't been used since '87; and before that... the '80's? No. The 70's? No. Not since 1965 had Topps used a team logo on players base cards. Could that be right??? Starting with 1952 through '55, Topps used the team logos. After a brief break they used them again from '58 through '60. They didn't bring them back until 1965. And not again for 22 years. It is strange. People seem to hold a special place in their hearts for their team's logo. Why would Topps avoid using official logos for such a long period?